First off: it is a story with a Happy End. So far. And it has not yet fully finished. 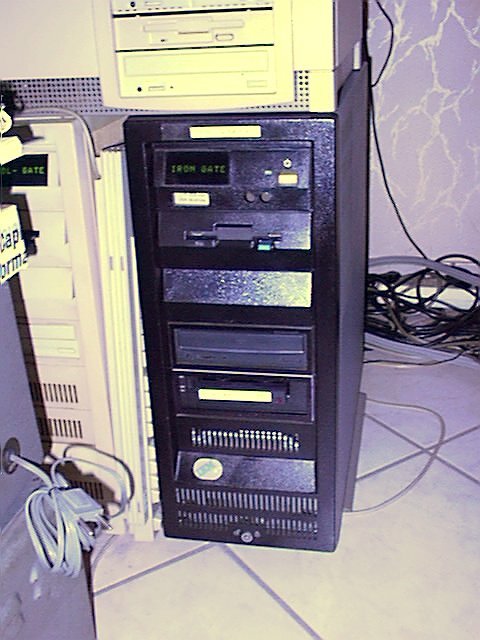 Blackbird started its life as an "ordinary" IBM PS/2 Server 95, a 9595-AMT to be precise. It has a Type-3 processor platform with a 50MHz 486DX CPU - a real 50 MHz, not this clock-doubler DX2-25/50. So it was a pretty fast 486-class machine back then, when it was new. 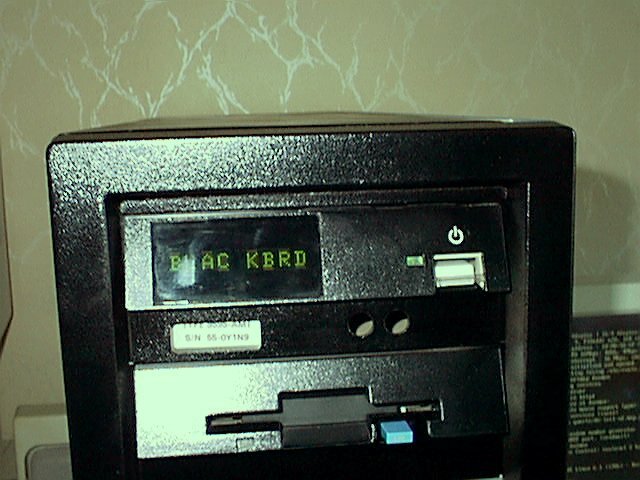 The first five years of its life the machine spent as an OS/2 Server in a bank in Germany distributing data to and from Automated Teller Machines. Then in mid-1999 - in the beginning hystery about potential Year-2000-problems - it was turned down and replaced by something else. I bought it for the small contribution of 50 DM (about 25 US$ at that time) to the banks "IT-department coffee box". It came with a slightly aged 1GB IBM 0662 harddisk and a network adapter plus 16MB ECC memory. The machines' case was pretty much scratched - obviously it had been "booted" quite often by the crew. Not because it did not run, but because of the fact that it was placed a bit oddly under the admins' desk. So the left sidewall showed a lot smears and stripes from shoes. I tried to clean it as good as possible - but in vain. So I thought "What the heck ...!" and took it totally apart ... and I mean totally - not only open it to get the collected dust bunnies out. This would be a good occasion to do what I always wanted to do: painting a Mod. 95 in raven-black - like the actual series of IBM Netfinity machines. The case was entirely stripped, fully taken apart (e.g. rear wall off and HD-bay carrier out), washed and cleaned with a destilled water / alcohol mix to get the case surfaces de-fatted. After that I painted all outer surfaces, bezels and frames with an "airforce grey" zinc-chromate primer to give the follow-up paint a good surface. Then letting it dry for several hours. Then I repeated the step with a raven-black, silk matte color from spray-cans. Sadly the color coverage was not ideal - and I had underestimated the amount of paint that would have been used to entirely paint the whole machine. It was not enough to paint the right sidewall too. (Can be seen on the pictures below). I was pretty much convinced that Blackbird would become a nice machine and didn't want to wait - so I decided that I could as well paint the right sidecover and "other missing parts" later. So - after a one-day drying period - I started to re-assemble the machine again. It was - of course - totally black, though several parts were still missing, like one blank bezel and a CD-ROM. However: it looked a bit too black for my taste. All the symbols on the machine were covered with paint as well - so I took a razor blade and freed the molded symbols from the paint and they showed up in bright white afterwards. black IBM Netfinity keyboard. The monitor is a 9507 10.4" LCD TFT. If you look closely you will notice that the paint coverage is a little "cloudy". Sigh. I think I will have to paint over at least the plain surfaces once again. 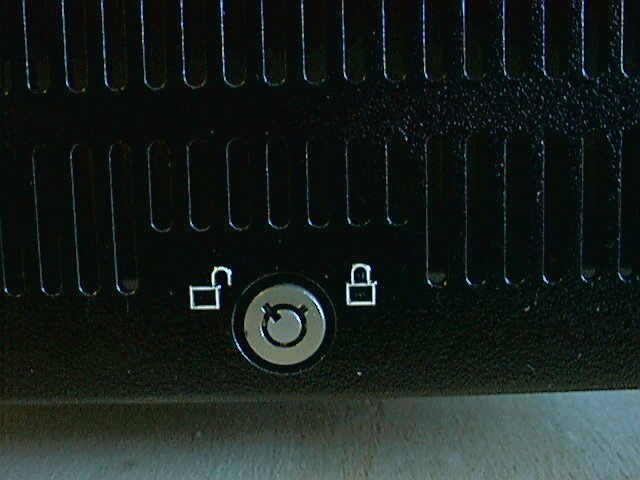 ... and so are the case lock symbols. Quite nice, isn't it ? As you can see: the CD-ROM and the blank bezel are still missing. But I have a black mouse and a black keyboard from the Netfinity Servers. Of course the LED-display shows the machines name. The two round holes are the "sin" of the previous owners. They had the audio-jacks from the CD-ROM put there. The power-switch has been reworked in the meantime for a better (blacker) look. Visible in this picture: the "airforce grey" sidewall only painted with the zinc-chromate primer. Also visible (for the experts): the machine runs XF86 with KDE under S.u.S.E. Linux 6.1 on the 9507 LCD screen. This is a much wider angle shot of the 95 standing on top of my workbench in "The Lab". 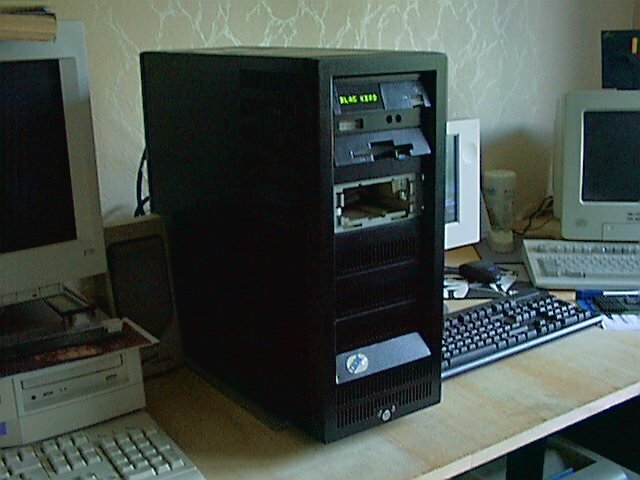 That picture was taken before I installed the internal CD-ROM - therefore the box atop the machine. 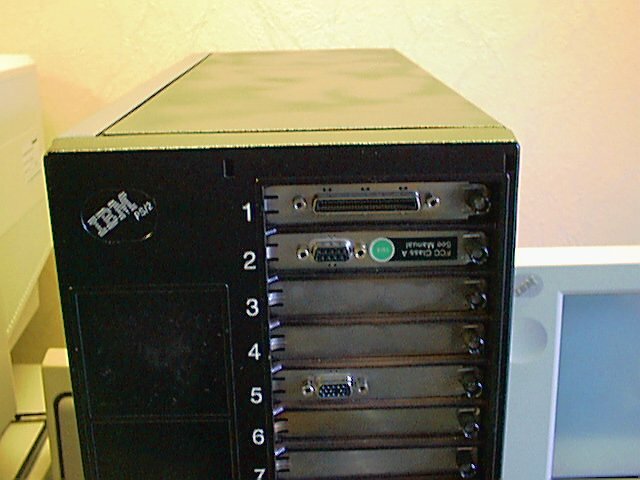 After the installation with SuSE Linux 6.1 went quite nice I planned to really use this machine as Intranet server with Linux and the Apache Webserver. Sort of "prooving ground" for my internet pages - how they look and if they run at all from off a real Unix box. From that point on Blackbird is no longer Blackbird: it has changed its name to IRONGATE. IRONGATE then got 2 x 2 GB and 1 x 1.05 GB drives, an additional 3Com 3C523 Ethernet adapter and - much more important - a new CPU. The DX-50 was quite good, but not good enough. The tides of fortune (with bidding at www.ebay.de at the right time - and winning !) washed an AMD Am5x86-133ADZ and an appropriate Voltage Regulator / Interposer to my shores. In "3x clocking" position the AMD runs at internal 150 MHz clockspeed on the 50 MHz baseboard ... and makes IRONGATE one of the fastest 486-class machines, which runs stable and reliable on a 24 hours / 7 days basis. Linux shows 75 bogoMIPS for the CPU. Not bad for a 486, eh ? Above you see the double-decker Type 3 "M" platform with the processor in the upper deck. Between processor and card there is this regulator / interposer. The heatsink atop the AMD 5x86 is a halved Pentium-II heatsink. With a digital thermo probe the temperatur on the heatsink never exceeded 45°C - so the chip temperature will surely below 70°C ... The two chips with the grey heatsinks to the right of the CPU get warmer. The machine got 64MB Parity memory, which is easier to get and cheaper than ECC and an internal CD-ROM. I got a black tray-loaded Sony CDU625S 20x drive. It looks a lot better and I avoided the hassle and pain with taking any other standard drive apart and paint it. Just recently I added an Exabyte EXB-8505 8mm tape streamer, which I happen to get on Ebay rather cheap and which - to my surprise - turned out to be entirely black. Another nice fit. 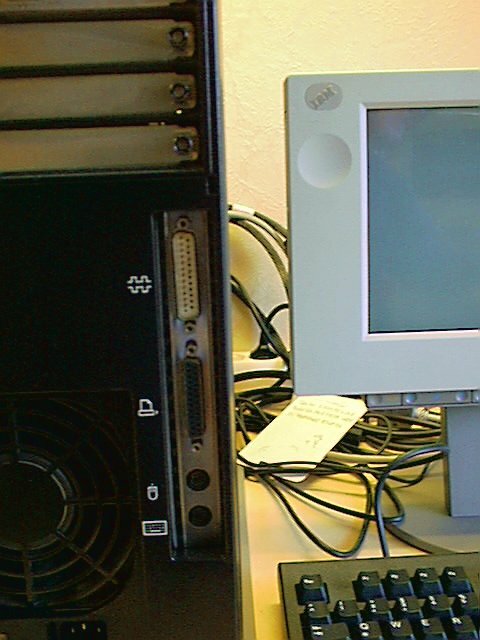 To show the actuality of that machine: it is running Linux 7.3 with a home-made MCA kernel version 2.4.16, along with the Apache Webserver version 1.3.19, proFTPd 1.2.0.rc3 and SAMBA 2.0.7. The 2.4.16 kernel had been compiled entirely on IRONGATE, which is another proof for the reliability of the AMD 5x86 CPU. Sometimes overclocked processors tend to come out with very funny behaviour - but not on this machine. The software running on IRONGATE is pretty much decent - and that is more you could (normally) await from a machine made back in the early 90s. Yet - the right sidewall is still in "airforce grey". I simply haven't found the time to do the painting. The tape streamer bezel also needs some "fine tuning". 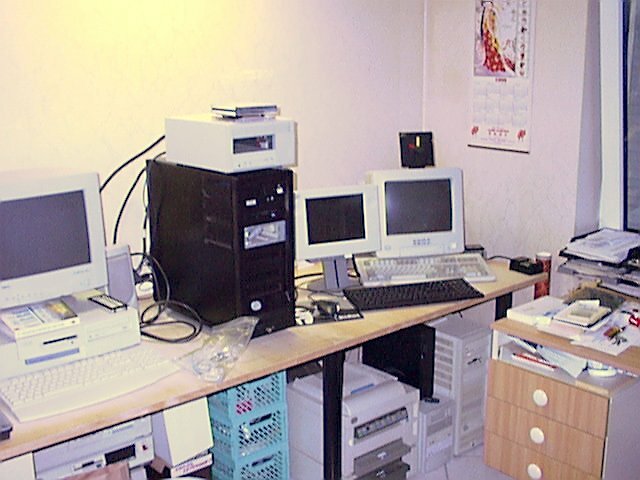 The importance of IRONGATE is documented by the fact that it is placed side by side to the 9595-S30 (Non-Array) with the name AOL-GATE - which is my main machine for Internet / AOL / Webdesign and suchlike. 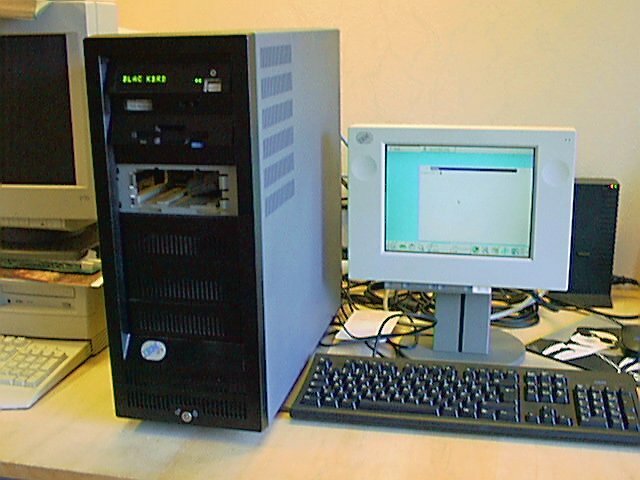 The both make a nice "mirror image" standing together and on top of them sits a Compaq DeskPro 590 with the CD-ROM burner stuff. Want to go and see the MCA Enthusiasts Page ... ?